After lawyers, child support, and alimony, there’s not always room in the budget for self help. Yet, stepmoms are navigating one of the most complex and under-advised roles out there. It’s not as if common sense can guide you through working with your husband’s ex and raising someone else’s child, or prepare you for the insecurities and jealousy of being a second wife. We need all of the budget-friendly help we can get. Here are 15 free stepmoms resources to improve your life! The Stepmomming Ain’t Easy Facebook group is a safe space for stepmoms to share resources, seek guidance, and offer support to others. There are over 2000 active members ready to help you through your journey and make it clear to you that you’re not alone on this journey. We have your back! 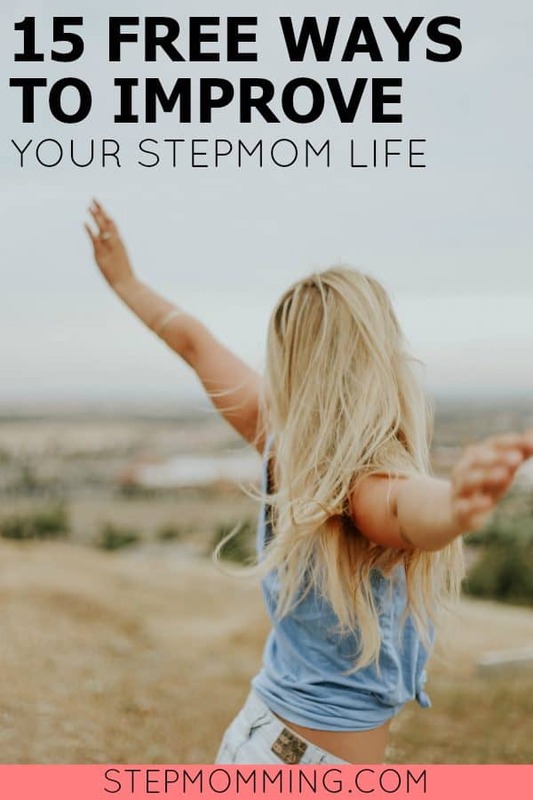 Follow the link to a free 5-day email series by Stepmomming that empowers stepmoms to take back control and change the evil stepmom narrative. By regaining control, stepmoms learn to write their own happily ever afters! The Becoming a Co-Parenting Champion eBook is a free downloadable book designed to help parents learn more about co-parenting, stop making common mistakes that contribute to the problems, and develop stronger, healthier relationships with their child’s other parents – all in order to raise their child in a happier, healthier way. Download your challenge calendar filled with an idea every day to help you gain new perspective and improve your co-parenting relationship with the Mom. Every small step we take towards peace and understanding, is a step toward peace for our family, and ourselves. It definitely feels unnatural the first few times you recite affirmations to yourself. But with time, it becomes easier and feels more natural. You begin to believe the things you’re saying, and you begin to really believe in yourself again. It’s just like with exercise (New Year’s resolutions anyone?) – you make small little changes to develop a habit and work toward better general health. With a few small mental shifts, you’ll find yourself in a much healthier mental state thanks to your new habits. The Blended Family Podcast is a bi-weekly show with a strong focus on strategies and methods to help your family thrive. Blended families face many difficulties and challenges which can sometimes drive families apart. The goal of this podcast is to help your blended family grow together through these challenges and create the peaceful and loving home you desire. Here’s the episode where I was interviewed on the Blended Family Podcast. Published quarterly, the Better than Blended Magazine features articles from experts all across the blended family spectrum. You’ll hear from dads, stepmoms, and coaches. So far, only 2 issues have been published, but I am so excited about the progress of the magazine! One of my very favorite stepmom bloggers Jamie Scrimgeour answers one of the biggest shared parenting questions, “How do I get my stuff back from mom’s/dad’s house?!”. Inside this free guide, she shares 9 tips to help your stepchildren remember to bring their belongings back! Grab it while you can! Gina from This Unexpected Love just gets me. I love traveling, scrapbooking, and my family. She provides a free travel journal specifically for blended families with prompts to ensure you get all of those memories down on paper to look back on in the future. Anna de Acosta has an entire album full of guided meditations just for stepmoms! She gives away two of the meditations for free on her website, so definitely take advantage of this incredible offer! Blended and Black has an ENTIRE LIBRARY full of eBooks for you to read – for free! Winner winner, chicken dinner! Find some me time to relax with a free help book to get you through the difficult situations. It doesn’t take much to get caught up in the negativity of stepmotherhood; there’s a lot that goes unnoticed. Stepmoms are often underappreciated. But Aimee from The Happy Stepmom is sharing some positivity with us! Don’t miss out on your chance to download these prints! If you think you’ve never been resentful as a stepmom, you’re in denial. But Nathalie from Step-Mom Strong Coaching shares with you the 4-part process to turn that resentment into empowerment! Pretty powerful, right? Get in on that action! Some of the highest rated stepmom help books (like Stepmonster and The The Smart Stepfamily) are available on Audible and luckily Audible has a free trial! Now you can listen to some incredible stepmom advice while you drive, workout, or clean! The Babbling Blonde is sharing her 7 best tips for becoming Stepmom Strong! You’ll feel happier and more confident once you download the free guide and gain access to her top secrets! Whether you choose to take advantage of one of these free stepmom resources or all of them, I know you’ll walk away a better woman, wife, and stepmother for it! Am I missing an incredible resource?! Let me know in the comments! PS: Can’t get enough? Here are some of my other favorite stepmom resources!